Well, that’s a headline you’re not going to see on any of WD’s contemporary covers. 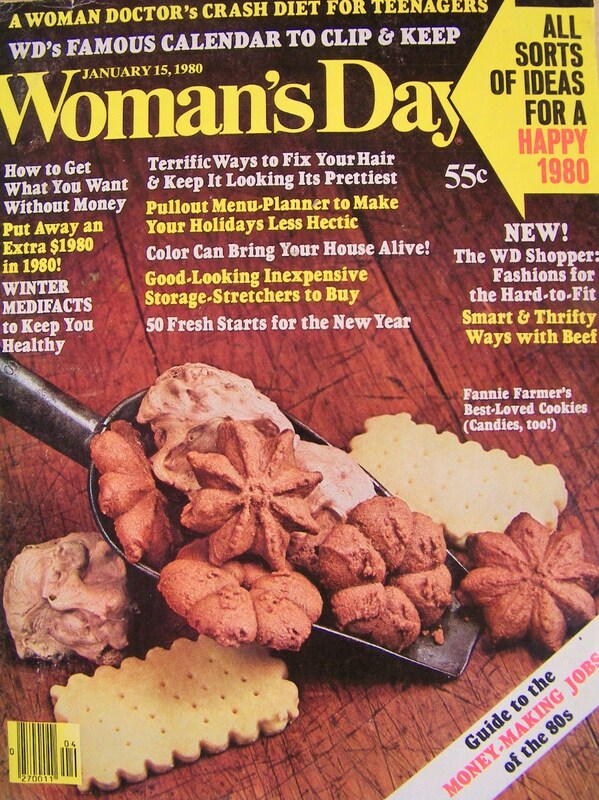 I was kind of hoping that said diet would include some of those groovy earth-tone cookies. Also the ones at the top and left of the picture look like lumps of igneous rock. Crash diets are OK as as long as you understand why you are losing weight. There is nothing magical about them; they are a fast, healthy way for normally thin and healthy people to lose weight in an emergency. I think we’re playing fast-and-loose with the word “emergency”, there, Dr. Edelstein. Don’t use any of the things that make food a little tastier- no ketchup, salad dressings, spices and very little salt. Eat no favorite fruits like apples or bananas. Yeah, I’m totally sure it was all of that cumin that got me into this weight loss EMERGENCY in the first place. She lost ten pounds and felt wonderful. This actually kind of explains how the “Jar Full of Tongue Depressors Diet” and the “Powder-Free Latex Gloves, Medium, 100 Count Diet” got their names (obvs, my doctor didn’t have a window in her office). Ok, let’s hold up a minute right there. Never mind that by 8th period I’d be chewing up my Problems In Democracy textbook for nourishment, but that also doesn’t sound like the most portable lunch. Cook it at home and take it to school cold. If you don’t like cold hamburger, too bad- I still want you to eat it. You repeat this every day for TWO WEEKS. Despite the good doctor’s insistence that “you won’t believe how much you’ll ‘go’ on this diet!”, it all kind of sounds like a formula for never pooping again. One of the biggest problems in crash dieting is that after about two or three days, the dieter begins to feel weak or light-headed and may interpret this feeling as a need for food. No, no- you’re fine. You just had a cheese cube, remember? Only 6 more hours until your next demitasse of skim milk! This entry was posted in Magazines and tagged 1980, Magazines, Woman's Day. Bookmark the permalink. Your comments on this diet are hilarious! I was searching for this diet (I’m a product of the 80s) and…I currently have a dieting emergency! Lol. Thanks for republishing it. Glad I was able to help! 😉 I swear that someday i’m actually going to try all of these crazy 70s & 80s magazine diets and report back on them. Please don’t. We want you to stay alive and healthy. I read this book cover to cover and back again. Never could stick to the insane eating plans in the book. I thought I was fat back then but I wasn’t. I would give anything now, 39 years later, to weigh what I did in HS. It’s not hard to think you’re fat when you’re comparing yourself to your 95 lbs friends. Oops meant to say 30 years later, not 39. Scary! And in different eras there would be shrieks about the saturated fat in the hamburger and cheese and the cholesterol in the egg yolk. In “The Unchosen” the lead character goes on a diet of steak and water, I think. It makes the point that while she loses weight, she feels and, more importantly given the reason for the diet, looks terrible. Me again, my comment was actually related to the book “The Woman Doctor’s Diet for Teenage Girls” by Barbara Edelstein. But this magazine article looks like it came from the same book. I wish I had kept it. I would love to read it and look at the eating plans again. Betty lou, I just checked ebay, there are lots of copies of the book available there. Thanks I’m gonna check it out! Thanks for commenting! I saw Amazon had a listing for the book version- I actually love reading vintage fad diets, I’ve been thinking about doing a feature on the ones marketed specifically to teenagers!